Dot Money may be the most important book of our time. It has the potential to transform the world and the lives of every individual for the better. This book explores the creation and use of money, global monetary systems, and our preconceived ideas of money. Then it reveals how ordinary people can take control of the money system today, making it work for them as an alternative to just working to make ends meet. Dot Money is more than a book it is a movement. Dot Money reveals the next step in the evolution of global economics and shows us how to solve the most important problems of our time. This book has the potential to enable us to overcome poverty, and increase the standard of living for every human being regardless of their current resources, education, race, religion, health, geographic location, political or social affiliations. The last chapter of the book has inspired the creation of the Dot Money Project. Dot Money is a virtual currency being created in order to help stabilize the value of all major currencies and the global economy, and provide a minimum monthly substance payment to every peaceful person in the world in order to end poverty. Dot Money uses similar technology as BitCoin but with improved performance and expanded capabilities that will enable it to truly help the world. The real value of Dot Money is based on human potential and the power of human will to overcome individual and global financial challenges. More specifically the value is based on the value of each individual user of Dot Money as a consumer. Consumers help to stimulate the economy throughout their lives by purchasing products and services including food, shelter, education, medical care. Ultimately Dot Money will lead to reduced taxes and a reduction in the financial burdens of government. The author, Eric Majors, is an activist and an expert in financial market analysis and algorithms, with a Bachelors of Science in Electrical Engineering from the University of Colorado. Mr. Majors is a former U.S. Registered Investment Advisor and business owner who worked with the CIA. He has served as an officer and director of a number of publicly traded companies and as a principal of an international investment banking firm. He is an expert on global currencies and was the principal inventor of Trade Series Management Theory and the associated TSM financial market software systems. Mr. Majors is a certified Consciousness Coach, business advisor, speaker, teacher and author. 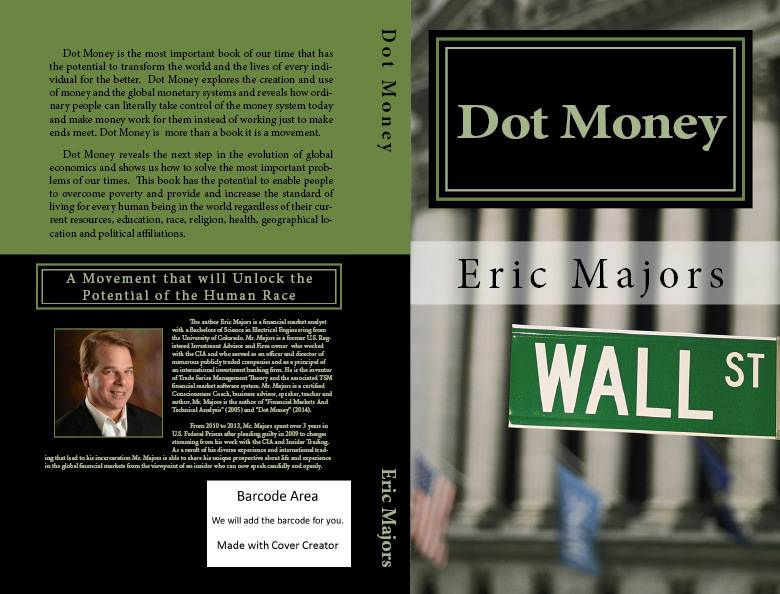 Mr. Majors is the author of several books including “Financial Markets And Technical Analysis” (2005), “Dot Money” (2014), “Dot Money the Global Currency Reserve, Questions and Answers” (2015) and “Dealing with Loss for Believers and Everyone” (2015). From 2010 to 2013, Mr. Majors spent over 3 years in a U.S. Federal Prison after pleading guilty in 2009 to charges stemming from his work with the CIA and Insider Trading. As a result of the diverse experiences and international exposure that led to his incarceration Mr. Majors is now able to share his unique prospective on life and the global financial markets. He does so from the viewpoint of an insider who speaks candidly and openly.